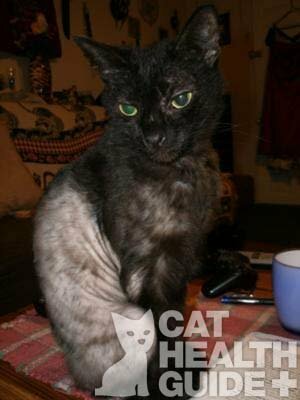 "Cat hair loss is not always a problem, with shedding a natural part of a cat's life. Cat's shed more during warm weather months. Shedding also varies by breed. The biggest difference between normal shedding and hair loss that isn't normal is when new hair doesn't replace any thinning hair or bald patches. A cat that is losing hair has multiple potential causes including flea allergy, excessive licking, mange, ringworm, stress and thyroid disease . Treatment is based on diagnosing and eliminating the underlying cause." Excessive amounts of cat hair loss is not normal an can indicate some type of underlying disease. Cat's normally shed, with more hair loss during warm spring and early summer months. It also varies by breed. If your cat is losing hair, but the hair is then replaced, then this could be normal for your cat. If the feline hair loss results in a thin or bare area, then you should consider problems that are not normal. 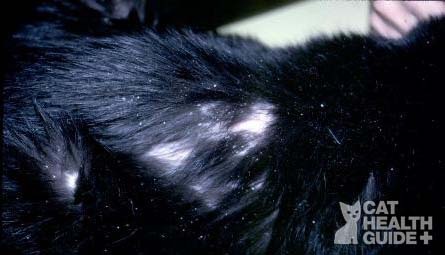 The location (s) where a cat is losing hair can indicate the cause as described below. Flea allergy dermatitis: Cat flea allergy occurs when a cat is allergic to the flea’s saliva. Cat hair loss or thinning hair down the middle of the back to the rump indicates a flea problem. The chance that cat flea allergy is likely the cause increases if the hair loss is accompanied by bumps or scabs. Symptoms include intense itching (itch causes your cat to over groom or chew the fur), redness, scaly patches, and hair loss. This is treated by treating both the cat and the environment for fleas. In addition, the cat may be treated with steroids and/or antihistamines for the itching. Cat flea problems can occur in indoor and outdoor cats as people can bring fleas into the home. Treatment involves using a product to kill any fleas on your cat with a herbal dip such as Naturasil, and a preventative such as Frontline Plus. Be sure to clean your cat's environment as well. 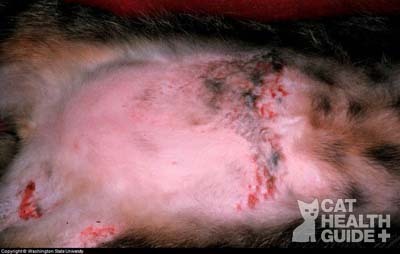 Feline Psychogenic Alopecia: or Psychogenic dermatitis: Feline psychogenic alopecia occurs if your cat licks herself, due to anxiety, stress, or boredom, until there is cat hair loss and skin irritation. This is seen in 10 to 15% of cats and often in conjunction with other underlying causes. Cat hair loss on the belly could be due to one of the non-physical causes listed above such as boredom. Cat's suffering from this condition often cause the hair loss themselves by licking the belly instead of the hair just falling out, which is often assumed by the owner. Licking the belly could indicate that the cat is suffering from stomach or abdominal pain. Look for other signs of abdominal illness such as abnormal urination, diarrhea or vomiting. Visit your veterinarian if you see any of these signs. It is possible that the cause is idiopathic, meaning that there is no known cause. If all medical causes for a cat losing hair are eliminated, a homeopathic formulated to calm cats suffering from anxiety such as Pet Calm might be worth trying. If possible, the underlying cause of the anxiety of stress is removed. Licking can be restricted with the use of special collars. Behavior modifying medication may be necessary. Some Veterinarians do not believe that this disorder exists, and instead believe that the problem is stomach pain. Allergic contact dermatitis: When a cat comes in contact with something she is allergic to, such as poison ivy or chemicals, hair loss can occur. Symptoms include red skin and small bumps or blisters in the exposed areas, itching, and hair loss with chronic exposure. Treatment includes avoiding the irritating substances, steroids, and antihistamines. Atopy (allergic inhalant dermatitis): your cat inhales something she is allergic to, such as pollen or dust mites. Symptoms include licking her feet, inflamed ears, scratching, and hair loss. Treatment includes reducing exposure to the irritants, steroids, and antihistamines. Food allergies: Symptoms of cat food allergies include licking her feet, inflamed ears, scratching, and cat hair loss. The specific allergies may need to be determined through food elimination trials. From the collection of Dr. Barbara Stein. Cheyletiella or Demodicosis mange: this is caused by the Cheyletiella mite. Symptoms include itching, scaly skin, and cat hair loss. It is treated with medication. Diagnosis is done with skin scrapings. Treatment requires a miticide to kill the parasites such as Naturasil. Pregnancy and nursing: shedding is common at this time, and hair lost will grow back. Endocrine System Issues: if the thyroid gland is producing excess or too little thyroid hormone hair loss can occur. Diseases of the endocrine system include hyperthyroidism, hypothyroidism, hyperadrenocorticism and Diabetes mellitus. Symptoms include cat hair loss, hair that is easily pulled out, and oily skin. Other symptoms include increased appetite and weight loss. Treatment involves surgical removal of one or both lobes of the thyroid gland, radiation therapy to destroy the damaged thyroid tissue, or medication to correct the diabetes or hormone replacement. Cushing's Disease: If the pituitary gland is not functioning possible it results in too much of a substance called cortisol in the blood. Symptoms of feline cushing's disease, in addition to hair loss accompany this disorder including an enlarged abdomen, weight loss, hyperactivity, vomiting or diarrhea plus excessive eating, thirst and increase in the frequency of urination. Diabetes Mellitus: Feline diabetes can cause hair loss in cats and is seen with other symptoms such as weight loss, desire to eat, excess thirst and increase in the frequency of urination. Ringworm: this is not really a worm but a fungal infection. It gets its name from its appearance, which is a red ring with a white center. It can leave scaly, bald patches. 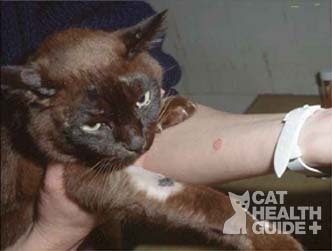 Cat ringworm is treated with anti-fungal medication such as Naturasil for Ringworm. Your veterinarian will examine hair in both healthy patches and where it is being lost. The first test is to determine if the hair can be pulled out with a simple pull or broken off. Examination for Parasites: Your veterinarian will comb your cat's hair and take a skin scraping to determine if fleas or mites are causing the condition. Depending on what is found a treatment for fleas or mites (Demodex, Cheyletiella, Otodectes) is recommended. Look for fungus: A special lamp is used (Wood's lamp) to see if their is fungus on the hair. If fungus is found then your veterinarian will prescribe the medication fipronil which can be given as an ointment (7 day treatment) or oral drug (called nitenpyram). If your cat does not respond to either of the above your veterinarian will recheck your cat for parasites after 4 weeks or look for food allergy as a cause of the condition. Dietary Change: An elimination diet will be recommended where your cat's diet is changed to few ingredients. Additional ingredients are added until symptoms reappear. Foods eliminated include fish, beef, dairy, pork, chicken, lamb/mutton, eggs and wheat. Feline atopic dermatitis test: If food allergies do not appear to be the cause the next step is to test for some type of skin allergy or atopy (skin sensitivity to allergens that you are born with) through a series of skin allergy tests. Your veterinarian could also prescribe medications to help with allergic reactions such as antihistamines. If all of these causes are ruled out then the trigger is either something that has not been diagnosed such as an allergic reaction to your cat's environment or emotional distress caused by cat's inherited disposition or stress in your cat's life. Causes of stress includes separation anxiety when you leave the house, the introduction of a new pet into the household, a new child or even the rearrangement of furniture in the rooms where your cat lives. Have a question about cat hair loss? Our veterinarian will answer it for free. To help provide the best answer possible, please include your cat's medical history such as age, breed, medications, skin condition, location your cat is losing hair and any changes in behavior. Please include a picture if you can. We will do our best to answer questions quickly (it depends on how many we receive each day). If you need an immediate response we suggest using this online cat veterinary answer service that is available 24 hours a day. Your question will appear on a Web page exactly the way you enter it here. Please do not type in all capital letters.